Back home, an MRI showed that the Benders’ baby had two brain tumors. After surgery, the pathology report revealed atypical taratoma with rhabdoid features, or AT/RT. This type of malignancy, almost always fatal in young children, called for very aggressive treatment. 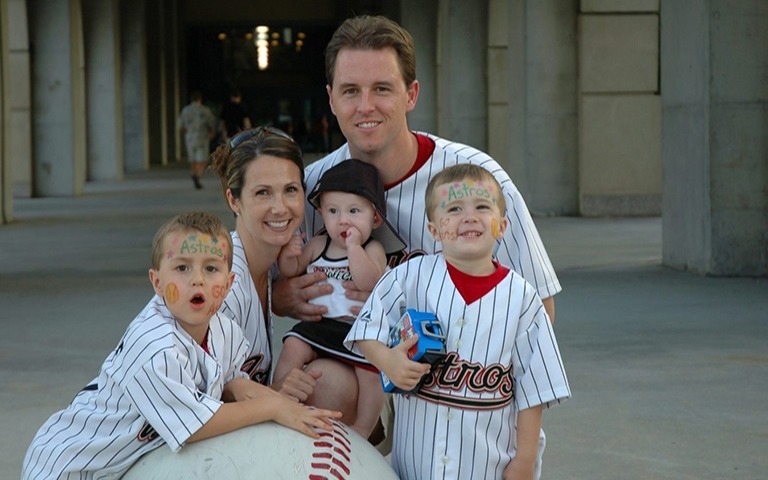 Chemotherapy, multiple surgeries and radiation treatment over the next six months were struggles for the Bender family. But Addi’s mother reports that her child never complained and always had a smile for everyone. Amber and Tony Bender enjoy an Astros game with their daughter Addison and sons Riley and Trent. Photo courtesy of Amber Bender. The idea to establish a foundation began while Addi was still in the hospital. “Regardless of the outcome of the treatment, we knew we wanted to do something to better the situation for the patients and for research options. When you have a child with cancer, that’s pretty much your life, and we wanted to help other families,” says Amber. Addi did not survive her cancer, but she lives on through research on her tumor cells, called AB001. Vidya Gopalakrishnan, Ph.D., assistant professor in pediatric research, is working to take a new drug therapy to a Phase I clinical trial. Through fundraising activities such as theater and scrapbooking events and an annual 5K Walk by Faith race, Addi’s Faith Foundation anticipates raising $200,000. Giving the entire amount to MD Anderson was a fairly easy decision for the foundation board, reports Tony.